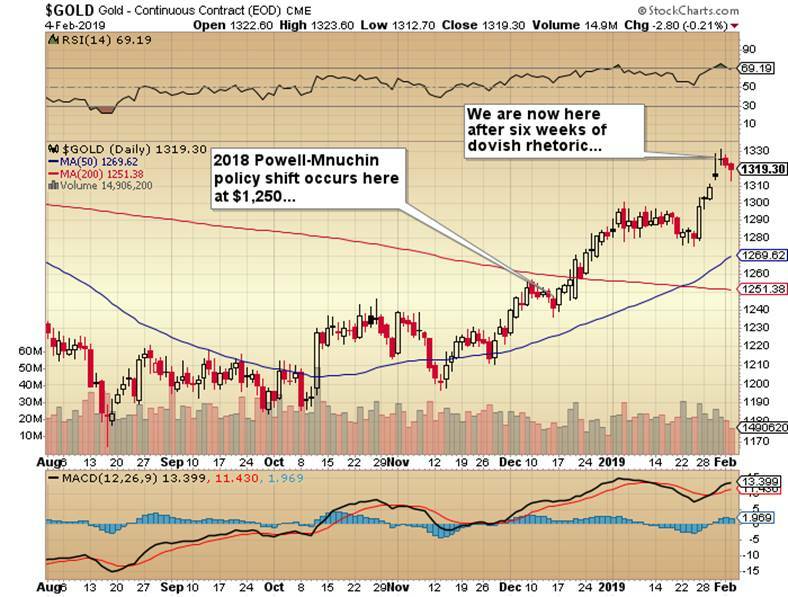 The reason I am mentioning this is that due to the recent rally in gold and silver, services that were nowhere to be found in late August with gold just off the lows at $1,167 (as in when I wrote “Back Up The Truck”) have suddenly determined that gold at $1,300 is a better reason to pull the trigger NOW rather than five months ago at $1,167. Buying an RSI at 73 is “WAY BETTER!” than accumulating at < 30 so get out your cheque books and/or credit cards and sign up immediately before you miss out on that Friday night podcast. As you all know, I have been 100% long gold and silver since the summer and have only last Thursday issued a tweeted directive imploring my readers to "Use tight stops on all gold and silver positions" going into the Friday morning NFP ("phony jobs report") and sure enough, I was stopped out of my GLD and SLV calls for a 570% return for the GLD April $120s purchased in September and a 215% return for the SLV April $13 calls purchased at $1.00 in November. Celebrate? Not a chance. Five minutes after I received the fill, I was already nervous. OUT, and nervous. When is the world going to finally recognize that central bankers are not statesmen like Churchill or Ghandi or Roosevelt? They are “BANKERS” that are far removed from the plight of humanity; they deal in the world of “MONEY.” Their concerns are those of profit and power, not social justice or liberty. As we have seen from the emerging Vancouver/Chinese money laundering scandal, bankers will break the law for profit at the turn of a hat. The recent capitulation by Jerome Powell was not in the slightest “data driven” unless, of course, 97% of the data was the closing level of the S&P 500 on Christmas Eve. The double-tap of leaving rates unchanged and ceasing the balance sheet roll-offs has now sent a message to the world that the U.S. cares not a whit about the purchasing power of its currency nor does it care about the potential harm to U.S. consumers of a weakening currency. 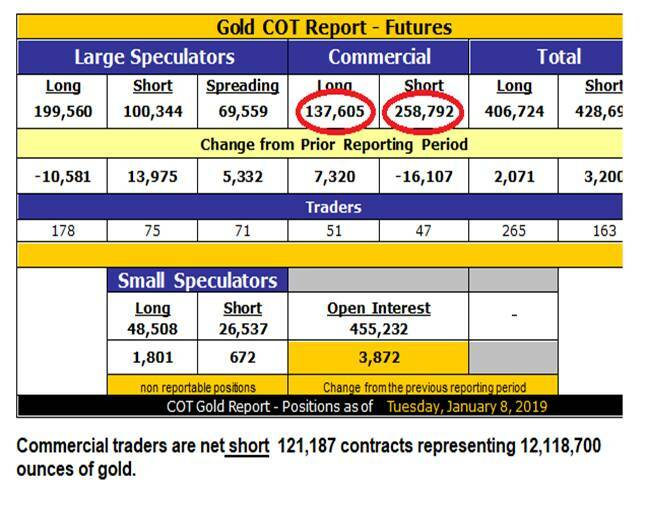 Open interest has exploded during the month of January such that by March 1 when they have finally caught up with the data delayed by the shutdown, the Dec. 24th 128,000-contract aggregate short position held by the Commercials will have easily doubled by then, which begs the question, from what level will they be unwinding those shorts? Will it be 200,000-plus shorts reversing from under $1,200? If you use history as a guidepost, probabilities favor declining gold and silver markets right through the month of February, and while the Fed policy shift and the declining dollar and the record central bank buying and the global slowdown might all be good cover stories with which to sell newsletters, the bullion banks control price and that just simply will not change. 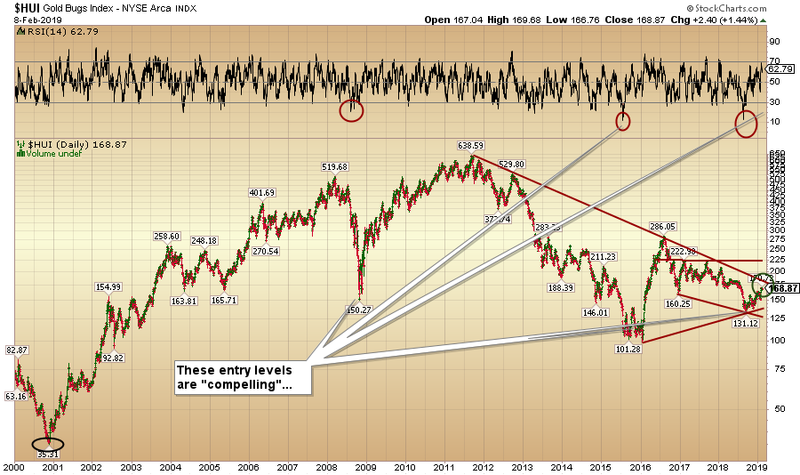 To be clear, I am a bull and that will not change but as for futures and options, I am sidelined. Physical bullion both gold and silver will remain in place as well as selected miners and explorcos because they don’t have expiry dates and they are fully paid-for. On these points, I want to be clear. As we close out the barometric month of January, it would appear that a particularly lethal bullet has been dodged, thanks largely to the mystical machinations of the financial media, the President’s Working Group on Capital Markets and the Global Banking Cartel fronted and championed by the Fed’s Jerome Powell. However, since there is nothing strikingly new to this author about interventions, bailouts and stock market rescue schemes, it should be noted that one of the best periods EVER for gold and silver came immediately after the 2009 bailout and successive liquidity injections of immense proportion and frequency. The two charts shown above offer unadulterated proof of the Fed-induced advance from $700 in late 2008 to over $1,900 by August 2011, and while that was then and this is now, the events of the past thirty-nine days have proven once again that while history may not repeat, it most certainly rhymes. The danger right now for the gold and silver markets is that since the Fed shift in policy was become so blatantly and embarrassingly transparent (almost to the point of vulgarity), they are going to go all-out to defend the U.S. dollar and, more importantly, bludgeon any and all enthusiasm for precious metals. The obvious victim of such a one-eighty in policy is the greenback, so it stands to reason that the masters of behavioral finance at the NY Fed will be vigilant in keeping sentiment focused on rising stocks, the “stable” currency and mitigated vigor for the PM’s. Monday’s predictable raid looked fairly ominous at 6:30 a.m. as I climbed onto the elliptical machine but what was a $10 drop for gold and a $0.25 hiccup for silver was nearly erased with some bargain-hunting just before lunchtime. I now await the inevitable descent of the RSIs for gold and silver back into the sub-30 range where they resided in mid-August when all of the podcasters were calling for $1075 gold. Since the Fed’s dual mandate is purportedly “maximum full employment and price stability”, I am proposing that they contact Google and Wikipedia and order the revisions to the posted mandate with the addition of “rising stock markets.” It didn’t seem to matter that up until Christmas Eve, most global stock markets were in either full correction mode or full-blown bear markets. 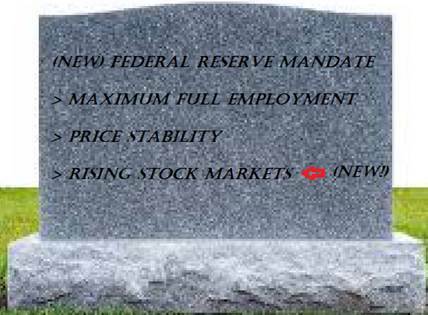 Only when the S&P 500 officially closed in bear market territory at 2,351 on Christmas Eve did the Fed and the U.S. Treasury go into full panic mode despite the lowest unemployment numbers in decades and with an inflation rate of only 1.7%. Based upon employment and inflation, there was actually NO REASON for the Fed to change course but since it did, stocks are ahead 15.6% and are now soundly away from not only bear market territory but also well clear of “correction” territory. I was engaged with a close friend of mine last weekend with whom I used to work back in the 1990s, and we were reminiscing about the “good ol’ days” when the buying and selling of securities was executed by carbon-based life forms that you could actually speak to on a land-line telephone. In the modern world of high-speed supercomputers and microwave transmission, it is difficult to speak with a computer programmed by (and for the expressed benefit of) the politico-banker cartel that needs order flow against which they can chip away at fractions of a penny but on millions of trades a day around the world. We were lamenting the days when traders would honor “pit rules” where many times an errant order improperly entered would be cancelled because the offending trader knew the broker and agreed to have the trade “busted” as long as he bought the trader on the “other side” (of the error) a beer after work at the Lock and Key Bistro. They were kinder, gentler times when the admission of error was not seen as a grave human frailty in need of counselling or psychiatric care. The direction of stock prices has recently become a gargantuan political football such that premiers and prime ministers and presidents consider stock index levels as part of their legacies. This is the primary reason why stock the markets are no longer fulfilling their original purpose, which was (and should be) to facilitate the financing of new ideas, businesses and industries. A healthy economy is one that boasts not about the level of the market averages but rather the amount of money raised by the industry for new and/or existing businesses in need of capital to launch, grow or expand. In today’s system of elitism, the really great ideas are usually financed by the monstrous venture capital funds and to participate in the early rounds of an Apple or Netflix or Facebook is “By Invitation Only” leaving the average investor on the outside looking in while the big profits are the intended domain of the elite crowd and their 1%-er social set. 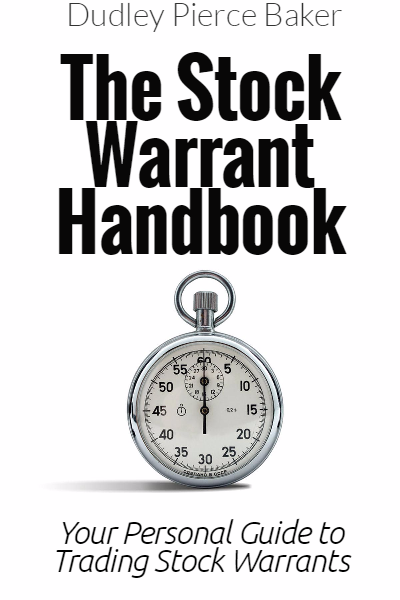 As the great Disraeli once wrote: “When men are pure, laws are useless; when men are corrupt, laws are broken.” That is how I view the global financial markets these days where at the mere mention of the term “bear market,” everyone immediately jumps to the ready in anticipation of the next Great Depression. I see it as a symptom of the financialization of the Western economic system where bear markets are to a financial economy in 2019 what drought or locusts were to agrarian economy pre-Industrial Revolution. The financial media uses stock price declines as fodder for the news-cycle cannons whipping up imaginary storms upon which the unsuspecting public are supposed to fret. People forget that in the worst decade in recent history, the 1930s, new inventions included frozen food, Scotch tape and the jet engine. There were two bear markets in the 1970s (’69-’70 and ’73-’74) and yet the decade delivered the Home VCR, the floppy disk, the first artificial heart and the cellular phone. And take away the punch bowl he did with two years of rate hikes and billions of dollars drained from the Fed’s toxic waste balance sheet. The only problem was that by Christmas Eve, it was painfully evident that the credit explosion of 2009–2017 constituted all of the air keeping the bubble afloat and removing it was going to take the S&P back to pre-explosion levels. Alas, as we are all now finally discovering, stock market advances are like toothpaste; once out of the tube it is impossible to get it back in. In other words, the Millennials and the Gen-X-ers who have never seen a real bear market that has the usual 12–18 month duration, having got a tiny whiff of what could happen in the last quarter of 2018, screamed so vociferously when the Fed-fueled 330% advance off the 2009 lows suddenly morphed into a 230% advance that they forced the politico-banker elitist cartel to gulp, blink, recant and finally reverse in order to save the precious stock market. The asymmetrical wealth effect governing consumer behavior in a financialized economy has now been righted and purchasing patterns are once again in line with the “global growth” and “MAGA” goals to the chagrin of those that believe in the sound money policies that Powell attempted with his long-overdue quantitative tightening campaign. To put this all into perspective, stocks are now up 291.32% from the lows of 2009 with the lowest unemployment rate in decades so the Powell about-face was about as “data driven” as the Guess Your Weight booth at the Ex.